An innovation based on the Mini LED Tubes, the aptly named Crystal Line is fitted with ultrabright LEDs for a clear crystallized light effect output. Only 23mm in width, the Crystal Line is an enhanced solution for entertainment, display, retail and architectural applications. It's fully programmable via direct DMX inputs. 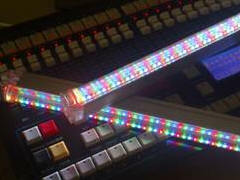 RGB color mixing as well as dimming and flashing effects make Crystal Line an exciting lighting product. Mono color versions are available on special order only. Proprietary design of the mounting brackets for easy and fast installation of the CrystalLine on both fixed and mobile occasions. Each CrystalLine comes complete with two brackets, each bracket to be secured with one screw through the middle, a separate screw applied on the side to fasten the CrystalLine.